KUALA LUMPUR: The Employees Provident Fund’s (EPF) total investment income rose 7.64% to RM12.39 billion in the second quarter ended June 30, 2018 (2Q18), from RM11.51 billion in the same quarter last year. EPF deputy chief executive officer (investment) Datuk Mohamad Nasir Ab Latif said escalating US-China trade tensions and the US interest rate hike has contributed to capital outflows from emerging markets, including Malaysia. This, he said, resulted in a less favourable trading environment in the domestic market. “While some developed markets, including the US and eurozone countries, recorded gains in their equity markets, the emerging markets, which include Asia, recorded negative returns. “As Asean was one of the worst performers, Malaysia was not excluded from the market downturn. Nonetheless, the diversification into different markets and sectors has enabled the EPF to record consistent performance with equities emerging as the main contributor during the second quarter,” he said in a statement. 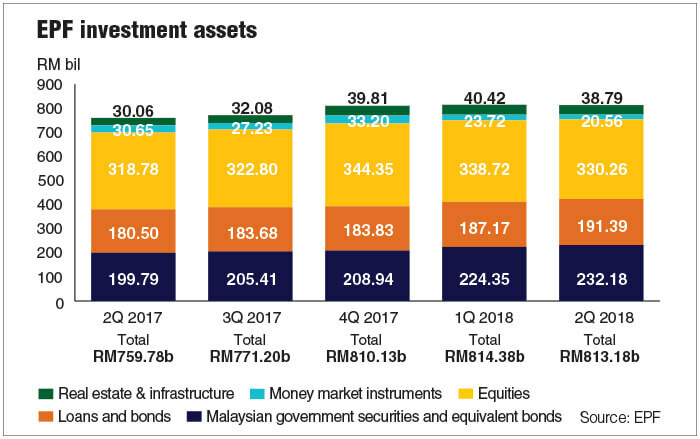 In 2Q18, equities, which made up 40.61% of the EPF’s total investment assets, contributed RM7.98 billion, representing 64.44% of total investment income for the quarter, said Mohamad Nasir. He said a total of 52.09% of EPF’s investment assets were in fixed income instruments, which continue to provide consistent and stable income. “The second quarter saw fixed income investments record an income of RM4.09 billion, equivalent to 33.07% of the quarterly investment income,” he said. “During the quarter under review, real estate and infrastructure recorded RM91.73 million in investment income. This asset class continues to provide the EPF with an inflation hedged return, with more income expected to come in the later part of the year,” said Mohamad Nasir. While the value of the EPF’s investment assets reached RM813.18 billion, up 0.38% or RM3.05 billion from Dec 31, 2017, it was marginally down from the first quarter of 2018’s RM814.38 billion, due to the drop in equity markets. “Notwithstanding the quarterly decline, the EPF’s asset position remains healthy compared to members’ savings balance of RM780.07 billion. Out of the total investment assets, RM322.89 billion, or 39.71%, was in syariah-compliant investment while the balance was invested in the conventional portfolio,” he said. He added that RM1.09 billion out of the RM12.39 billion gross investment income was generated for Simpanan Shariah, and RM11.3 billion for Simpanan Konvensional. total investment income during the quarter under review. Going forward, Mohamad Nasir said global market uncertainty continues to shroud the outlook for the rest of the year, given the continued political and policy risks such as the impending changes to monetary policies, uncertainty over the outcome of Brexit, and the ongoing trade tensions between major trading nations. “The EPF remains focused on delivering above-inflation returns, with at least 2% above the inflation rate over a three-year rolling period, which will preserve and enhance the value of our members’ retirement savings,” he added.